Richard (Paddy Considine) has always protected his simple-minded little brother Anthony (Toby Kebbell). When Richard leaves the rural village where they have grown up to join the army, Anthony is taken in by Sonny (Gary Stretch), a controlling and vicious local drug dealer and his gang of lads. Anthony becomes the gang’s pet and plaything. Seven years later, Richard returns to settle the score. One by one, he hunts down each member of the gang and executes them in increasingly elaborate ways as flashbacks reveal the extent to which his brother suffered at their hands. 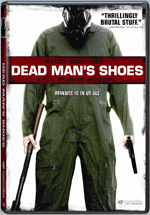 DEAD MAN’S SHOES is a genre-defying film blending horror, supernatural elements, comedy, and social realism. Set in a Midlands village, it explores the underbelly of contemporary rural Britain in communities where crime is unchecked and drugs, intimidation, and power games are blandly accepted as the fabric of daily life.